In part 2 of our Treasures in the Attic guide we’re covering what you can discover in birth, marriage and death certificates. You can read about the clues you can find in photos and from your relatives' memories in part 1, and military medals in part 3. If you are really lucky, your relatives might have copies of their own – or their ancestors’ birth, marriage (or death) certificates. These fascinating documents can reveal new facts about your ancestors, and can help you piece together the clues to get even further back. If you can’t find hard copies, don’t forget that Findmypast has millions of birth, marriage and death records, all of which can be easily searched for online. They list all of the births, marriages and deaths that occurred in England and Wales between 1837 and 2005. You’ll also find information about British citizens living abroad or at sea. The records will tell you the person’s name and the geographic district in which the birth, marriage or death was registered, as well as volume and page numbers. You can use these numbers to order a copy of a birth, marriage or death certificate from the General Register Office (GRO). *Prices correct at time of going to press. 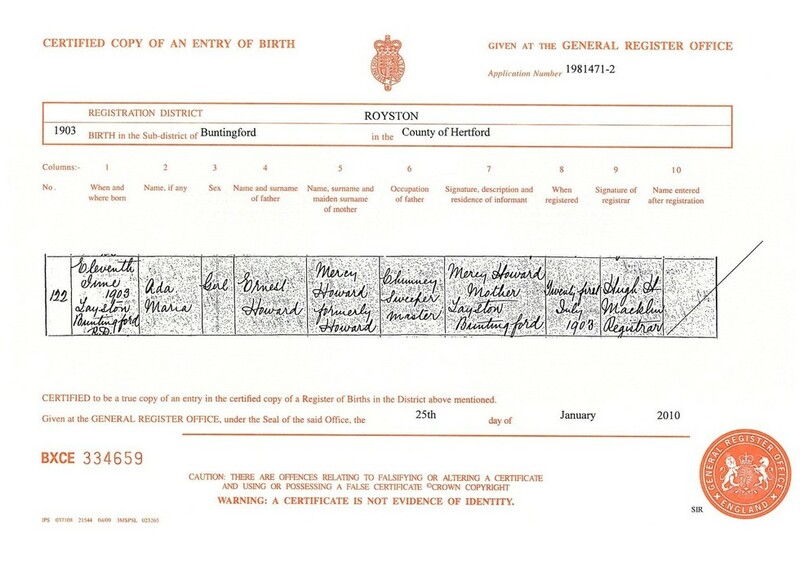 This is an example of a birth certificate. Here we see that Ada Maria Howard was born on 11 June 1903 in Layston. The certificate tells us that her father’s name was Ernest Howard, while her mother’s name was Mercy Howard. We also discover that her father was a “chimney sweeper master”. Marriage certificates can provide a lot of new information for your family tree. 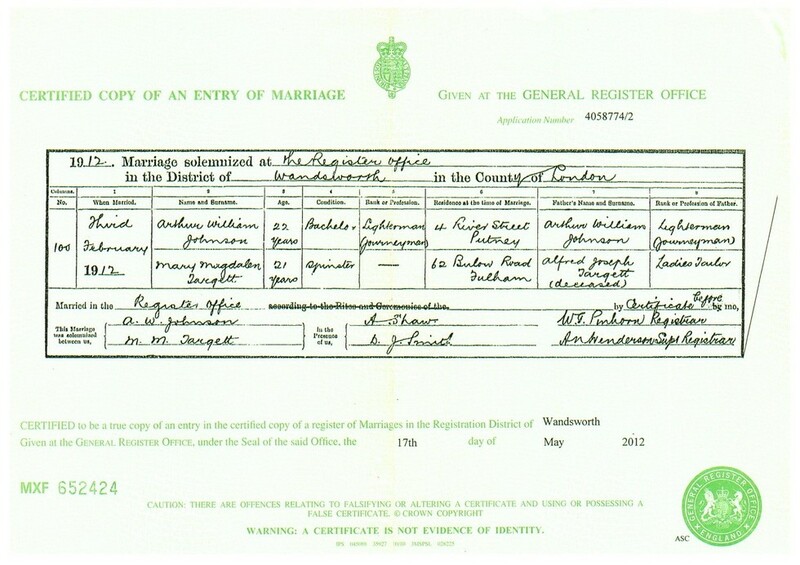 In the example here, the certificate tells us that Arthur William Johnson married Mary Magdalen Targett on 3 February 1912 at the Register Office in Wandsworth. It tells us the couple’s ages, their marital status and also that Arthur was employed as a lighterman (operating a barge). We also learn the addresses where Arthur and Mary lived, along with their fathers’ names and occupations. We can see that the lighterman trade ran in Arthur’s family and that Mary’s father was a “ladies’ tailor”. 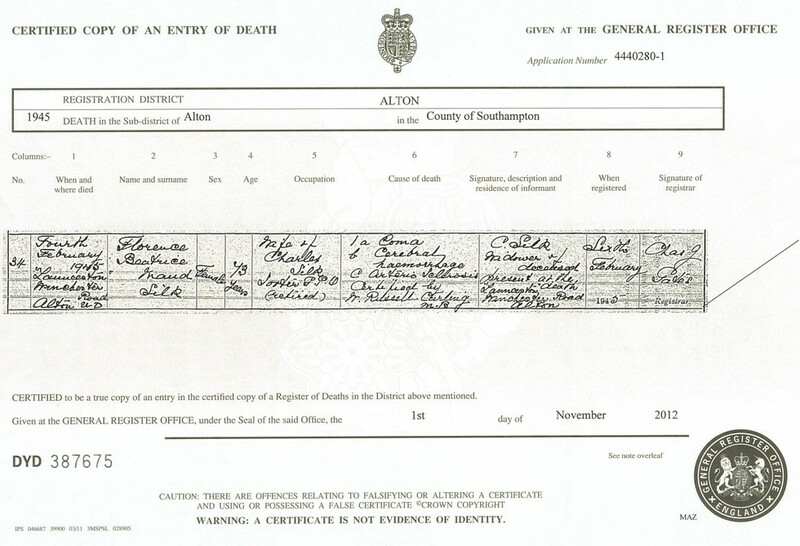 This death certificate reveals that Florence Beatrice Maud Silk died on 4 February 1945 at her home in Alton. It tells us that Florence was 73 and was the wife of Charles Silk, a retired sorter for the Post Office. We also learn the cause of death, and that Florence’s husband was present at the death. What have you found in your investigations? Post your discoveries in the comments section below, or post them to our Facebook wall to be in with a chance of winning a three month Findmypast World subscription.